The diary of a 'Florence Nightingale' nurse who helped soldiers during World War One is being sold at auction by her family. The moving diaries, complete with touching letters written by soldiers she treated in the trenches, will go on sale along with her pristine Red Cross uniform. Lucy Kate 'Kitty' Card was a nurse who cared for severely injured soldiers from the bloody Battle of the Somme, working in military hospitals in Le Havre, Calais, Rouen and Etaples. 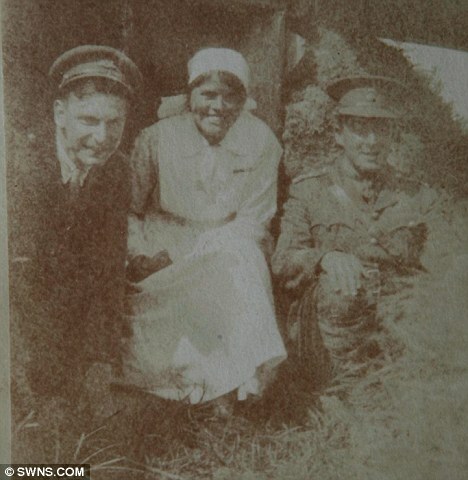 While there she kept a diary in which she wrote movingly about the horrors of the Great War. Now, almost 100 later, her memoirs are set to go under the hammer after being put up for sale. Her Red Cross commandant's uniform has survived remarkably well and, complete with its starched collars, will be part of the auction along with medals and sepia photographs. The collection charting Sister Card's career from 1914 to 1919 is expected to fetch between £1,500 and £2,000 when it goes under the hammer at Dreweatt's Militaria auction in Bristol on March 29. Militaria expert Malcolm Claridge, of auctioneers Dreweatts who will sell the collection in Bristol on March 29, said: 'It's extremely rare to find such a complete collection of a nurse who worked in British military hospitals during the Great War. 'It is amazing that her Red Cross commandant's uniform has survived in such good condition after nearly 80 years.